John Singer Sargent successfully painted the most unportrait-like portrait of all time. 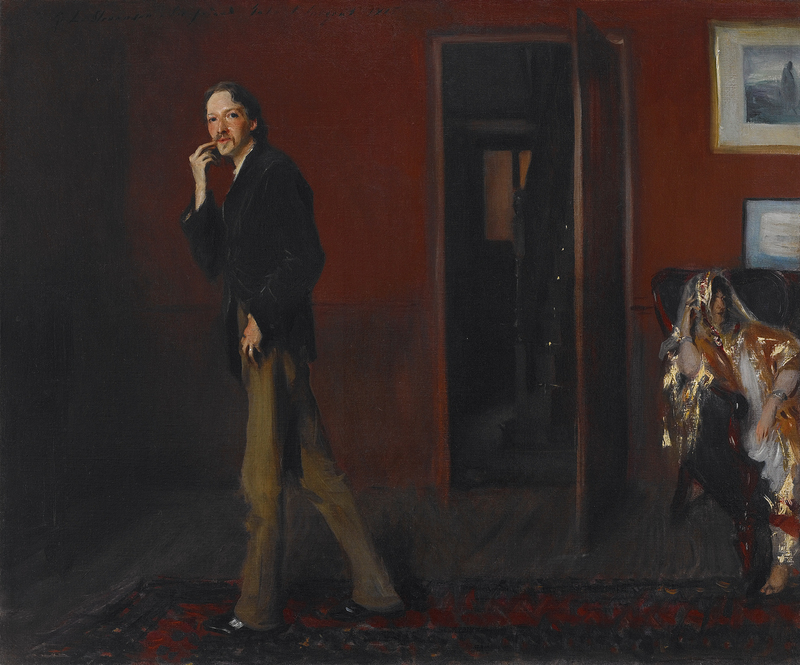 In what is supposed to be a portrait of the artist’s dear friends, the author Robert Louis Stevenson and his wife Fanny, you’ll actually find a rather supreme example of one of the best things art history has given us – the awkward portrait. If you thought American Gothic made you feel uncomfortable, well you ain’t seen nothing yet. But this isn’t to say that Sargent wasn’t a great artist; he was well-known and celebrated during his own lifetime, which is more than people can say about the now-infamous Van Gogh. In fact, Auguste Rodin called Sargent “the Van Dyck of our times.” Pretty nice compliment. Sargent made a name for himself painting portraits of the American and European upper class. For these commissioned pieces, he knew how to paint what people liked. But when it came to portraits that Sargent painted of his own accord, he did what he wanted. As he experimented and pushed the genre to its boundaries, these efforts yielded some interesting results. Like contemporary artist Chuck Close, Sargent loved to paint his friends. These rarely-commissioned portraits, done out of a labor of love, included great artists, like Rodin and Monet, and of course, the Scottish author Robert Louis Stevenson. While visiting the author’s home in England, Sargent painted three very different portraits. Charles Fairchild, a wealthy Boston banker, commissioned Sargent to paint a more traditional portrait of the author for his wife, who loved his work. This portrait, on the other hand, was the result of Sargent using the commission as an opportunity to experiment. As only he could do, Sargent tapped into and exquisitely portrayed the couple’s personalities. He emphasized Robert’s height and nervous disposition, as well as the strained relationship between the husband and wife. At this time, Stevenson had just finished writing the smash-hit novel "The Strange Case of Dr. Jekyll and Mr. Hyde," which may or may not have left both him and the rest of England a little wacky. It’s rumored that, after the story debuted as a theater show, Stevenson’s sinister characters inspired Jack the Ripper’s gruesome murders in London. On the play’s closing night, Jack the Ripper killed two women in the same night, which has since been known as “the double event.” Coincidence? I think not. Although it has since become the favorite painting of the National Portrait Gallery of London’s director Sandy Nairne, Robert Louis Stevenson and Fanny were a bit perplexed when Sargent presented this odd portrait to the couple as a gift. Stevenson described the portrait as excellent and eccentric, but ultimately “damn queer as a whole.” And I’d have to agree with that. Arnason, H.H., and Elizabeth C. Mansfield. History of Modern Art. Upper Saddle River, NJ: Pearson Education, Inc., 2013. Churchwell, Sarah. “How John Singer Sargent made a scene.” The Guardian. Art and Design. January 30, 2015. https://www.theguardian.com/artanddesign/2015/jan/30/how-john-singer-sar.... Accessed June 25, 2018. Jones, Aaron. “A Halloween Tale.” Crystal Bridges Museum of American Art. Blog. October 31, 2013. https://crystalbridges.org/blog/a-halloween-tale/. Accessed June 25, 2018. National Portrait Gallery. “Sargent: Portraits of Artists and Friends.” What’s On. https://www.npg.org.uk/whatson/sargent/home.php. Accessed June 25, 2018. The Metropolitan Museum of Art. “Robert Louis Stevenson.” Collection. https://metmuseum.org/art/collection/search/17494. Accessed June 25, 2018. The Metropolitan Museum of Art. “Robert Louis Stevenson and His Wife.” Collection. https://metmuseum.org/art/collection/search/21403. Accessed June 25, 2018.